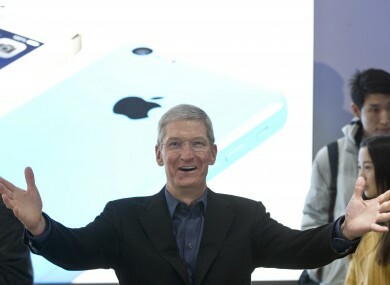 The Apple CEO, Tim Cook, was in Cork today addressing staff at its Hollyhill plant this morning before meeting Kenny. THE TAOISEACH dismissed claims the government makes specific deals with Apple or any other multinational companies with regards to its corporation tax rate. Discussing his meeting with Apple CEO Tim Cook earlier today, Enda Kenny said that Ireland is “participating fully” in EU discussions about its corporate tax rate, and mentioned the issue to him during their meeting. He said that the country has a legally-based statutory rate of 12.5 per cent that applies to all companies. I pointed out to Cook that Ireland, as a member of the [European] Union, is participating in the OECD discussions that are taking place now about an international response in terms of clarity about the tax position. There are fifteen different sectors involving that and Ireland is participating in them all. Kenny didn’t say if it was himself or Cook who brought the subject up, but said that the Apple CEO was “exceptionally happy” with the work the Cork office has done. Cook addressed staff in the company’s Cork office this morning before he met the Taoiseach. Kenny had a tour of the plant first before meeting with Cook to discuss Apple’s presence here. The Hollyhill plant employs more than 4,000 people in the office, and was Apple’s first office outside of the US. It’s the assembly point for the MacBook Pro laptop and was previously responsible for Apple’s original iMac machine. Apple recorded another successful quarter after it announced it made a $13.1 billion profit earlier this week. The company sold 51 million iPhones and 26 million iPads during this period. The Taoiseach also attended a jobs announcement in Mahon earlier this afternoon, where two Cork companies announced the creation of 200 new jobs over the next few years. Email “Taoiseach dismisses claims he makes specific deals with multinational companies”. Feedback on “Taoiseach dismisses claims he makes specific deals with multinational companies”.